I know, the task seems obvious, right? You just take one end of the cable and plug it in to the guitar, and the other end to the amp. Well, that’s essentially it if you don’t mind all the “pops”, loud bangs, and the possibility of ruining both your hearing and your amp. If you want to do it properly, though, you need to follow a set of steps. 1. Make sure that the amp is turned off. 2. Turn all volume knobs down completely. Both on your guitar and the amp. This will make sure that no unwanted sounds occur after you turn the amp on. 3. Take the cable and plug it in to the guitar and then to the amp. 4. Turn the amp on. 5. Turn the volume knob on your guitar up all the way. 6. Turn the “master volume” knob on your amp to the desired level. 7. Turn the preamp knob on your amp to the desired level. That is, of course, if there is such a knob on your amp. 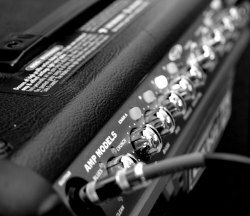 Many amps don’t have a separate preamp knob. Now let me quickly describe what to do once you finish playing. 1. Turn the volume knob on your guitar down completely. 2. Turn the “master volume” knob on your amp down completely (you can turn the preamp knob down as well). 3. Turn the amp off. I’m not exaggerating here. If you don’t treat your amp properly you can ruin it very quickly. Loud “pop” sounds are very unpleasant to the ear, and can also damage the amp’s speaker. Remembering these simple steps will keep you from unnecessary trouble.